Making a big change to your body – the kind of transformation that makes people do a double-take when you remove your shirt – requires a big effort. But it doesn’t have to take a lot of time, especially if you follow a progressive and challenging workout programme that’s designed to push you out of your comfort zone every time you step in the gym. Try this better-body plan over the next four weeks and you won’t just surprise your friends with how much bigger and leaner you become – you’ll also amaze yourself. This four-week workout is designed to make the biggest positive difference to your body through training just four times per week. Workouts 1 and 3 each week focus on your upper-body muscles, while workouts 2 and 4 are total-body sessions. All the workouts are made up of five moves but the upper-body sessions are structured slightly differently to the total-body ones to place the perfect stimulus on your body for the best possible results. 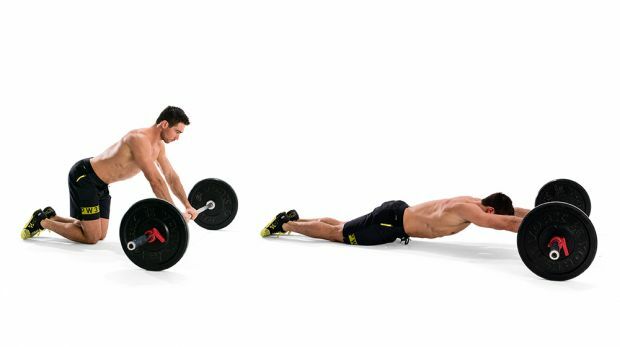 So while the total-body sessions are performed as straight sets, the upper-body workouts start with two straight sets and finish with a tri-set to fatigue the working muscles thoroughly. 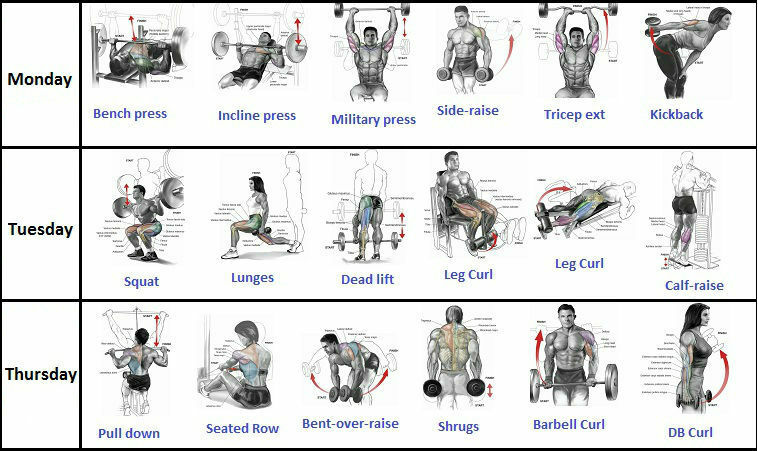 Do all the exercises in order, sticking to the sets, reps, tempo and rest periods detailed. Unless the guide says you should use a light weight, select the heaviest one that lets you complete the move with perfect form, and increase the weight slightly each week. 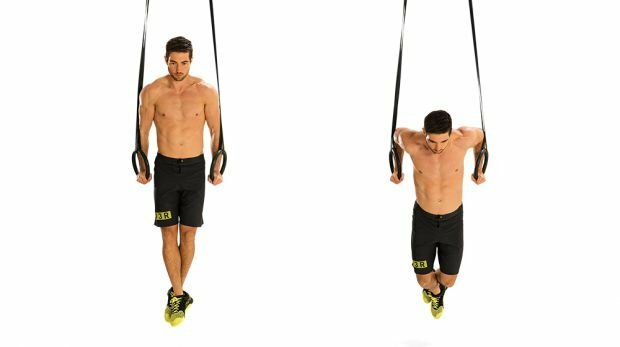 To get the full effect from these workouts, you need to stick to the four-digit tempo code for each exercise. The first digit indicates how long in seconds you take to lower the weight, the second how long you pause at the bottom of the move, the third how long you take to lift the weight, and the final digit how long you pause at the top. X means that part of the move should be done explosively. The accumulated time under tension increases your heart rate to burn fat and break down muscle tissue so it’s rebuilt bigger and stronger. Keep each rep smooth and controlled so your muscles – not momentum – do the work. 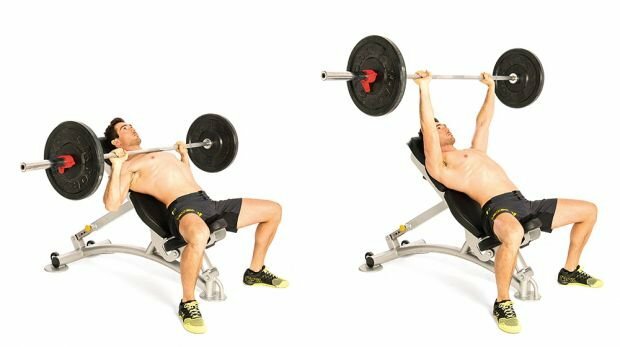 Lie on a flat bench holding a barbell with your hands slightly wider than shoulder-width apart. Brace your core, then lower the bar towards your chest. Press it back up to the start. Hold a bar with an underhand grip. Brace your core, then pull yourself up until your chin is higher than the bar. Lower until your arms are straight again. 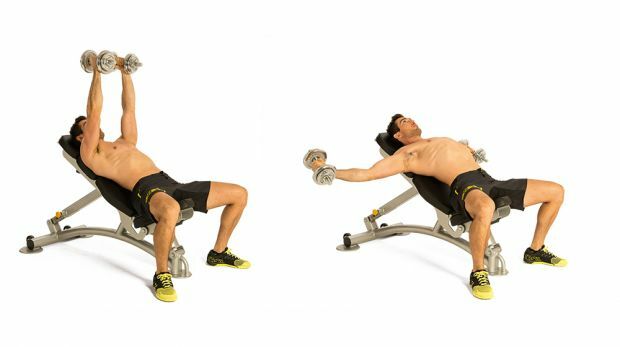 Lie on an incline bench holding a dumbbell in each hand above your face, with your palms facing and a slight bend in your elbows. Lower them to the sides, then bring them back to the top. 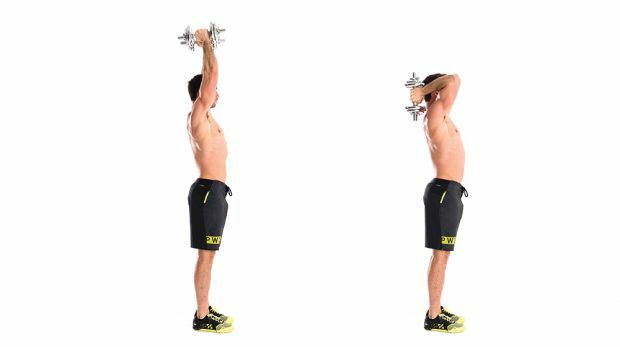 Stand tall holding a dumbbell over your head with both hands, arms straight. 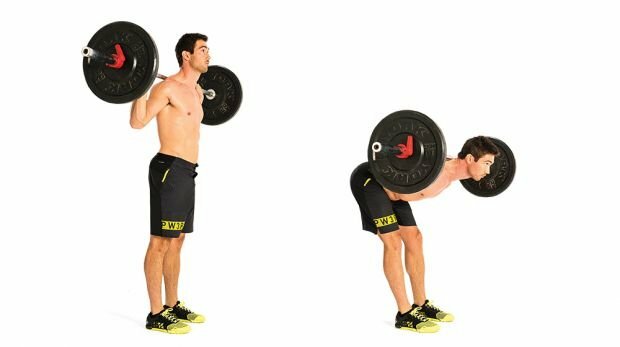 Keeping your chest up, lower the weight behind your head, then raise it back to the start. 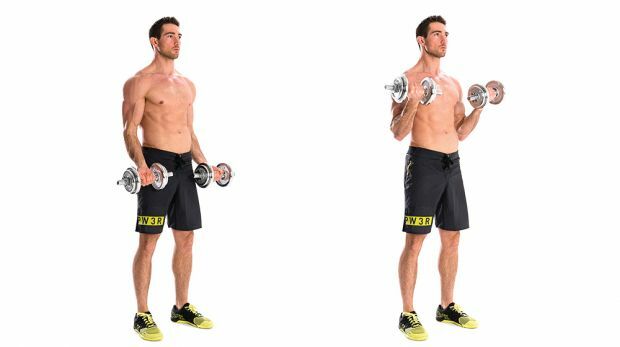 Stand tall, holding a light dumbbell in each hand with palms facing. Keeping your chest up and a bend in your elbows, raise the weights to the sides until they reach shoulder height. Lower back to the start. Stand tall with a bar across the back of your shoulders. Keeping your chest up and core braced, squat down as deep as you can. Drive back up through your heels to return to the start. 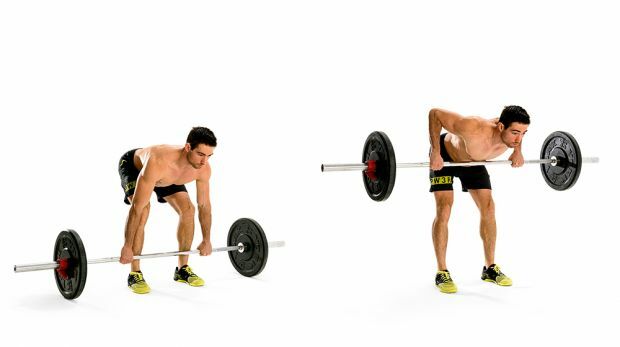 Hold a barbell with an overhand grip, hands just outside your legs. Bend your knees slightly, brace your core, then pull the bar up, leading with your elbows. Lower it back to the start. Grip rings or parallel bars with your arms straight. Keeping your chest up, bend your elbows to lower your body as far as your shoulders allow. Press back up powerfully to return to the start. Stand tall holding a light barbell across the back of your shoulders, feet shoulder-width apart. With your core braced, bend forwards slowly from the hips, as far as your hamstrings allow but not past horizontal. 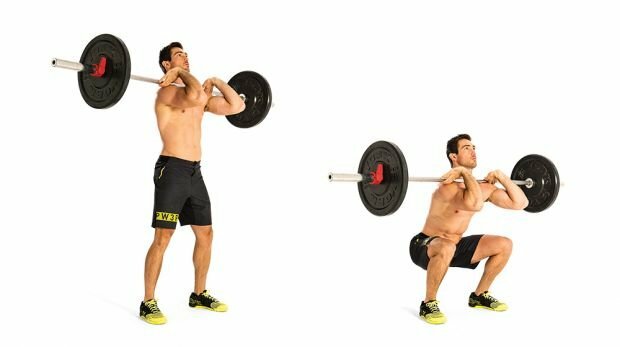 Related article: Build Monster Legs & Glutes With This Workout! Kneel on the floor holding a barbell with both hands. 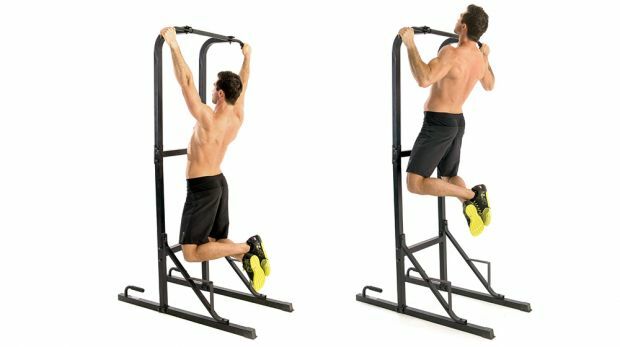 Roll the bar forwards so you lower your torso, keeping your core braced. Then use your abs muscles to return to the start. 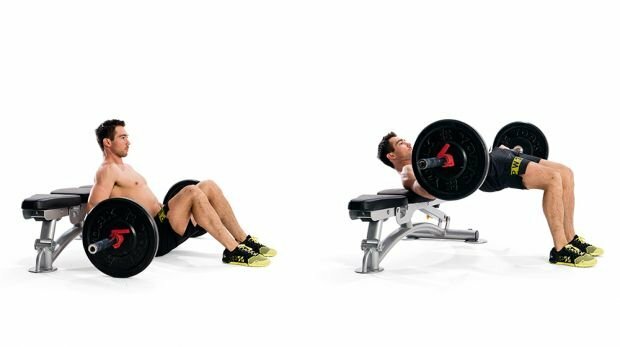 Lie on an incline bench holding a barbell with your hands slightly wider than shoulder-width apart. 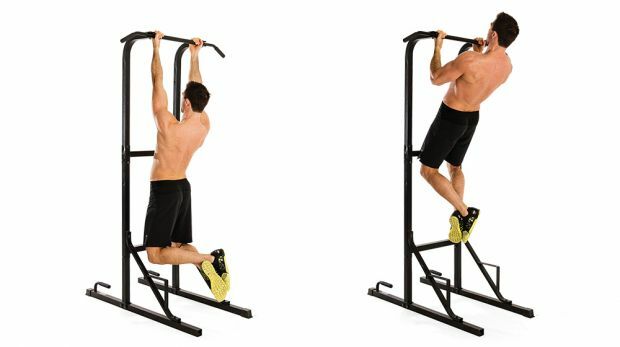 Hold a pull-up bar using an overhand grip with hands slightly wider than shoulder-width apart. Brace your core, then pull yourself up until your lower chest touches the bar. 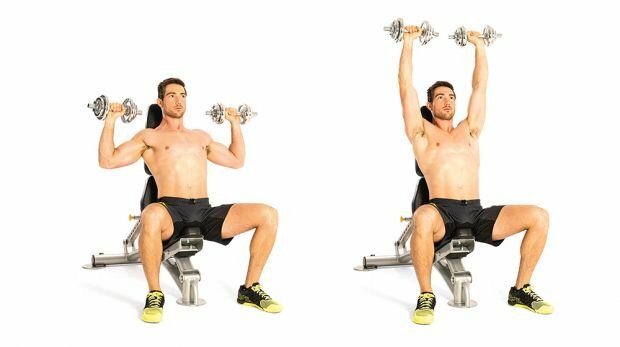 Sit on an upright bench with a dumbbell in each hand at shoulder height. Keeping your chest up, press the weights directly overhead until your arms are straight, then lower them back to the start. 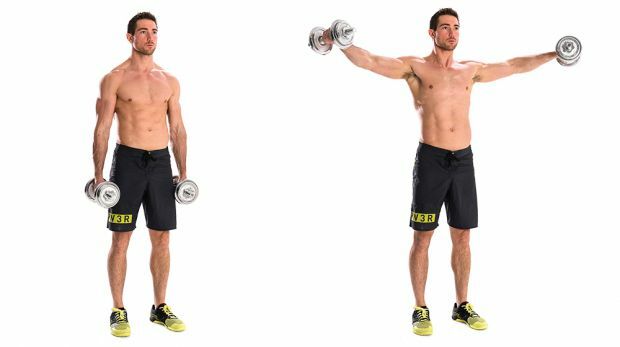 Stand with dumbbells by your sides, palms facing forwards. Keeping your elbows tucked in, curl the weights up, squeezing your biceps at the top. Lower them back to the start. 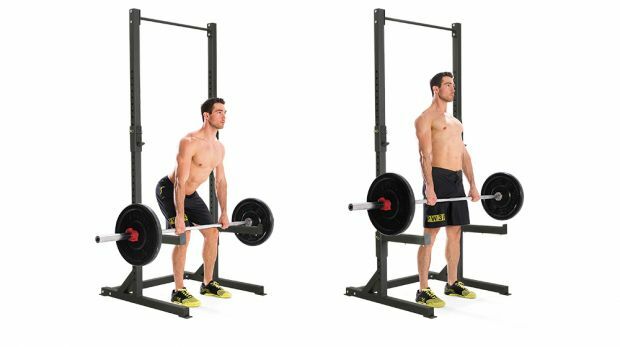 Related article: How Much Can You Lift – How To Calculate Your One-Rep Max (1RM)? 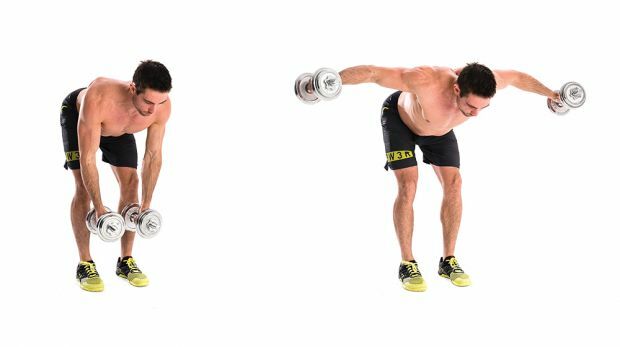 Bend forward from the hips with a light dumbbell in each hand with palms facing. Keeping a slight bend in your elbows, raise the weights out to shoulder height, then lower back to the start. 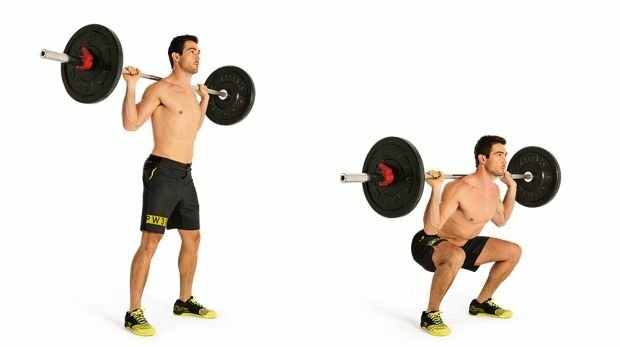 Stand tall with a bar across the front of your shoulders with elbows up. Keeping your core braced, squat down as deep as you can. Stand tall in front of a barbell resting on safety bars at knee height. Bend at the knees and hips, grasp the bar using an overhand grip and deadlift the bar up, squeezing your shoulder blades together at the top. 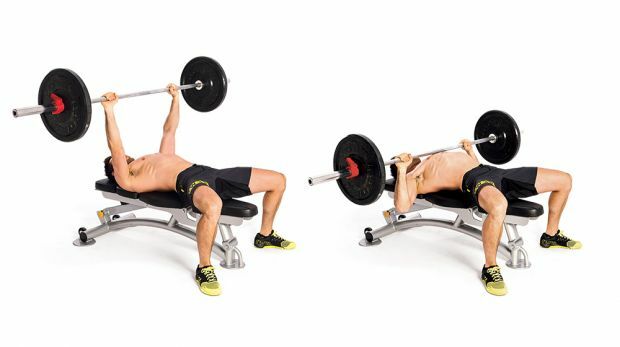 Sit with your upper back supported on a bench, holding a barbell across the tops of your thighs. Thrust your hips up and squeeze your glutes at the top. Then return to the start. 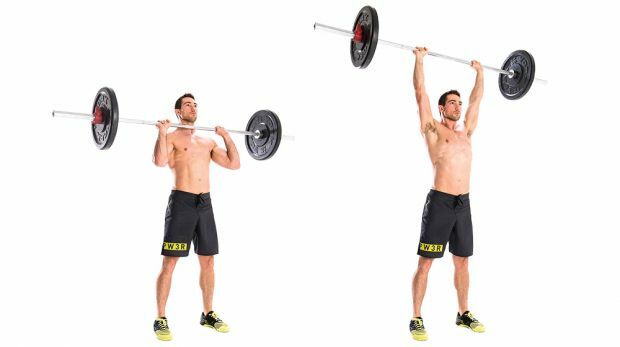 Hold a bar on the front of your shoulders with your hands just wider than shoulder-width apart. Keeping your chest up and core braced, press the bar overhead until your arms are straight.